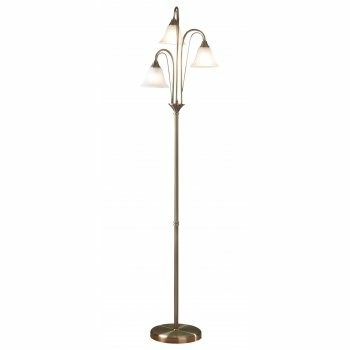 Dar Lighting Boston 3 light floor lamp features 3 conical white acid etched glass shade mounted on a thin stem supported by a circular antique brass base. The product code for this Dar floor lamp is BOS49. This sophisticated design would be a classy touch to any suitable room within your home and the antique brass finish adds that vintage look. Operated by a foot pedal switch. Also available in the Dar Boston range is a 5 light ceiling fitting, 3 light ceiling fitting, 2 light wall fitting, single light wall fitting and a single light table lamp.